[On the left] Tiruru Subcalism by Kaijin. I absolutley LOVE this new figure. The turquoise is wild! 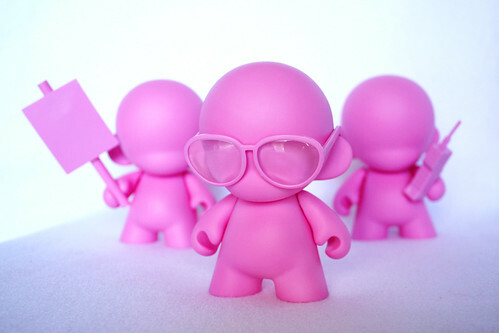 Tiruru is from the “Mysterious Island Jambara” series, and limited to 50 pieces. [On the right] Cutie Cane (2/16) by Flowbots. Hard to resist a face like that! 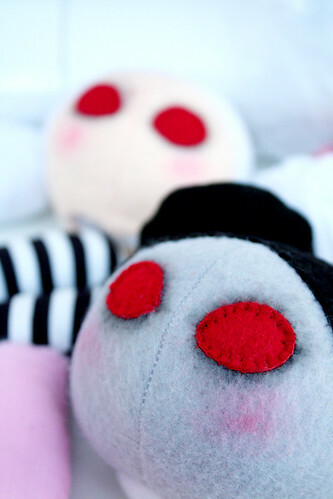 Plush Art Show: Stitch Wars > online shop is live! 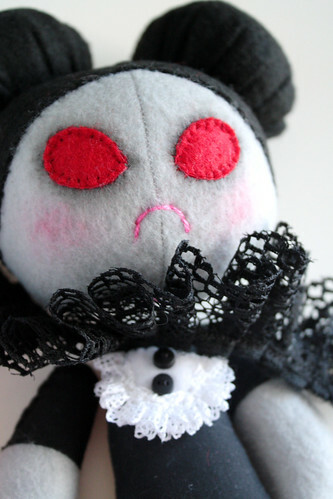 All the available works from Stitch Wars are now for sale in Bear + Bird’s online shop! My R2D2 has already sold, but Princess Leia is still available. 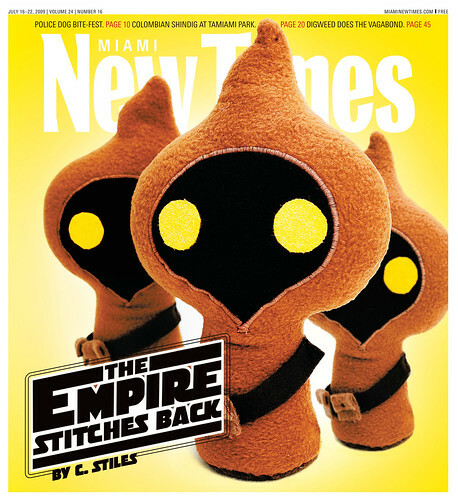 There are lots of Star Wars inspired plush creations by other artists, so go check it out! Go HERE to see all the available works! 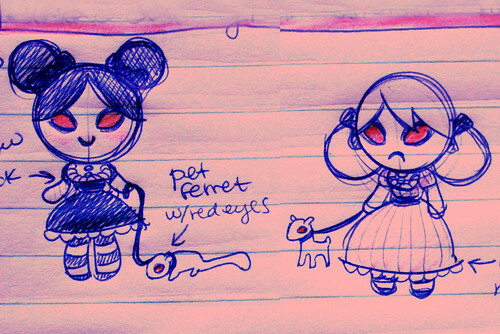 1) First I start out with a rough sketch of what I want to make. I already have an idea of what their personalities are like, and I try to bring that out in their expression, outfit, and overall look. My creative process is always evolving, and new decisions are made at every step that I could never have forseen with the initial sketch (later on you can see that I scrapped the dresses, and swapped the mouths). 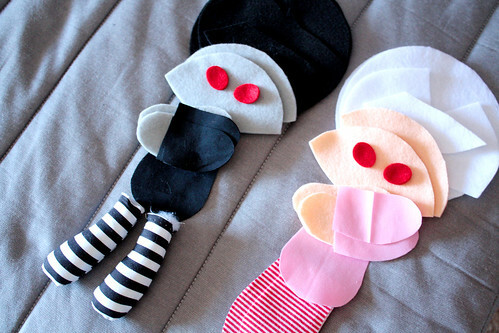 2) Next I choose the colours and fabric I want to use. I lay everything out in an abstract kind of way to help visualize what colours go together, and what don’t before I start cutting the fabric. 3) Then I cut everything out. It’s hard to tell that they’ll look any good at this point, lol. 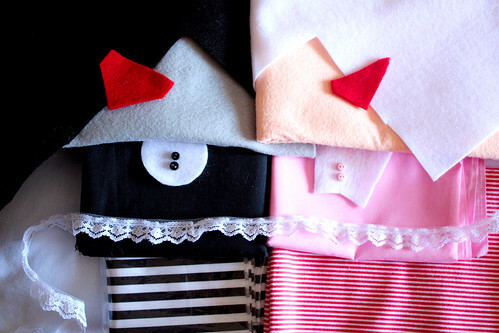 4) Then I sew everything together that I can with the sewing machine (it makes my life easier!) and I start stuffing body parts. 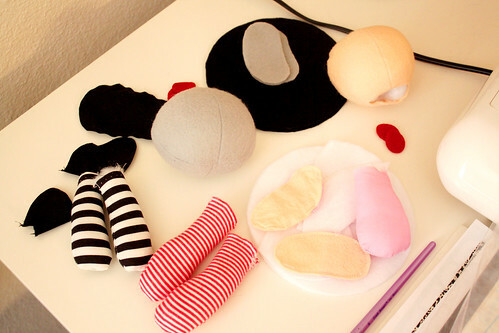 5) Everything is sewn together! 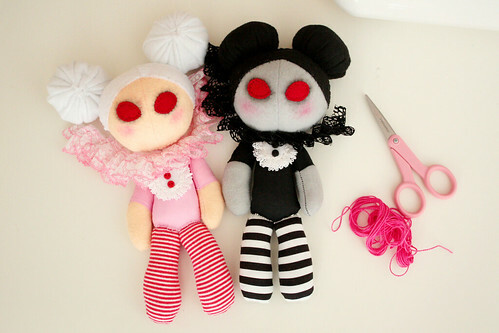 In this pic you can see that I’ve done a bit of handsewing already (sewn the legs on the body, sewn the hair on the heads, etc), and I’ve also pinned the eyes on their faces. I do this so I can start adding the smokey-eye look (with pastels and q-tips) exactly where I want before sewing the eyes overtop of the added makeup. 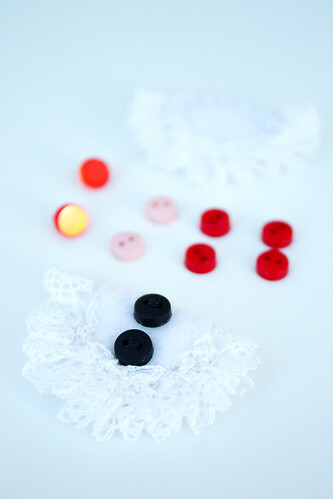 6-7) I hand sew the tiny collars for the dresses, and choose which buttons will suit the white-haired girl best. 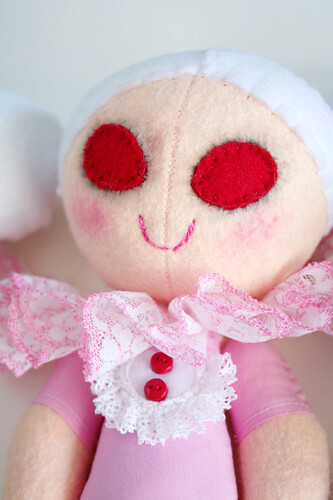 Then I sew their eyes on after adding eyeshadow and blush. 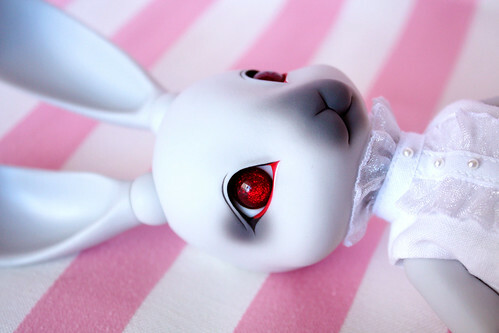 8 ) I think once they have smokey eyes, the dolls really start to come together and their personality starts to show. At this point I’m figuring out what type of lace I’m going to use for the ruffle collar and other lacey accents. 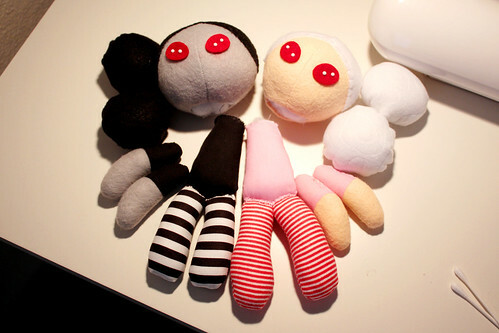 Their heads and arms aren’t attached yet… I do those last. The white-haired girl’s hair buns won’t be sewn on until last because her buns sit low on her head, and I need to have room to sew the ruffle collar to her neck first. The ruffle collars are then pre-sewn (so they are nice and ruffly), and ready to be attached to the bodies. In this pic I decided on pink mouths. 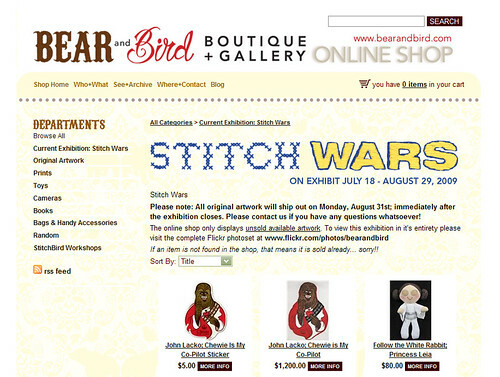 Stitch Wars opens this Saturday, July 18th at Bear + Bird Boutique+ Gallery! If you can’t make it to the show in person, or if you’d really like to buy a piece in advance, or are just curious, you can get a sneak preview of all the work in the show if you sign up on the Bear + Bird mailing list. This also gives you exclusive pre-show buying rights! 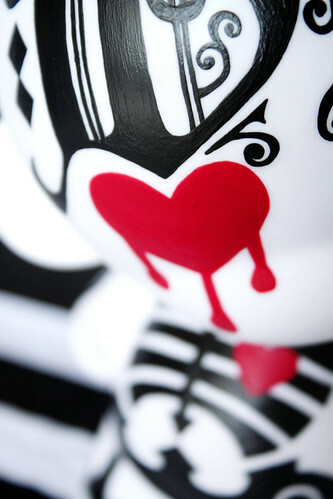 So if there’s a piece you really want, you can potentially buy it tomorrow. 🙂 The mailing list will go out tomorrow, so make sure to sign up now!